Many people who suffer from leg pain don’t realise they have sciatica and Many of our clients who experience sciatica feel like they are going to be stuck like this forever. This is just not true. In this blog I explain what sciatica is and give you 4 top tips for relieving it. Is a pain felt typically in the leg when the sciatic nerve becomes irritated or inflamed. This can be from a swollen joint in the lower back, a disc herniation or a muscle strain. Symptoms typically occur along the path of the sciatic nerve ( the largest nerve in the body which runs from the lower back all the way down to the toes) and can include but is not limited to tingling, numbness, weakness, aches, sharp pains in the lower back and back of the thighs and calves and/or shins and toes. It tends to affect one side in the majority of people but some people can be unlucky enough to experience symptoms in both. Bending, lifting and twisting can place undue pressure on the lower back and can cause a vertebrae to become stuck, sore and swollen which can then irritate the nerve or these actions can also result in a disc herniation where the gel like substance between the vertebrae in the spine (which acts as a shock absorber) bulges and irritates the nerve. In others ,years of inactivity and poor posture can result in weak, tight muscles- particularly the piriformis and hamstring-which can then irritate the nerve resulting in back and leg symptoms. Degenerative changes can result in the sciatic nerve having less space to exit the spine resulting also in pain. 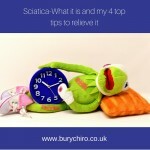 My 4 Top tips for helping sciatica. In rare cases surgery is recommended, however there are many things a person can do to help themselves and avoid the dreaded surgeons knife. Daily stretching can help ease sciatic symptoms – particularly of All the muscles around the lower part of the back and the muscles in the legs. Walking ( on flat ground particularly )as well as being a great exercise is also great for the discs in the spine and is low impact. Some exercises are more effective than others and depending upon the cause of your sciatica some should be avoided altogether. Using an ice pack appropriately helps reduce any inflammation that is there by removing heat from the region. 4. Seek help from a qualified professional. A targeted care plan which includes adjustments, stretches and strengthening exercises as well as specific lifestyle advice can effectively reduce and eliminate sciatica. This is where seeking the advice of a Chiropractor may be helpful in providing the most appropriate form of action. Do you want to find out if we can help you with your sciatica ? Call us today on 01617631700 to book a consultation and a verbal report of our findings which will include what we found, how we can help, how long it will take and how much it will cost. We have people waiting to take your call. It is our goal to help as many people as we can. If you liked this blog and found it useful please share it with others.